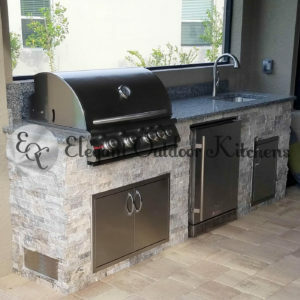 Elegant Outdoor Kitchens is professional outdoor kitchen manufacturing company located in Southwest Florida. Fort Myers is the county seat and commercial center of Lee County, Florida, United States. Fort Myers is a gateway to the Southwest Florida region and a major tourist destination within Florida. The winter homes of Thomas Edison (“Seminole Lodge”) and Henry Ford (“The Mangoes”) are a primary tourist attraction in the region. The city is named after Colonel Abraham Myers. The geographic statistical area is serviced by Southwest Florida International Airport (RSW), located southeast of the city. While our base of operations is in Fort Myers, we service all surrounding cities and townships. Offering our custom outdoor kitchen and BBQ Island construction services to Fort Myers, Estero & Naples. We’re the premier outdoor living specialists of Southwest Florida. If you’re looking for a professional BBQ Island manufacturer in Southwest Florida and would like to schedule an on-site consultation, give us a call today. Below you’ll find a list of communities that we continually design and construct custom outdoor kitchens in.